This is the evolution EVO180 saw which has paved the way for TCT Steel Cutting Circular Saws and this groundbreaking machine is still classed as the standard in Steel Cutting technology. 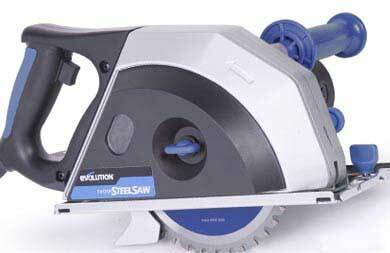 With a high power 1200-watt motor and generous 55mm depth of cut, this well-established circular saw is a revolutionary machine. The EVO180 will cut mild steel quickly and cleanly, without heat, burrs or coolant. Its compact dimensions and light weight make it ideal for use either on or off site. - 180mm (7") diameter TCT blade. - Designed to cut steel, aluminium, and stainless steel without heat, burrs or coolant. Also cuts wood.